The Great Ethiopian Run, founded by the legendary athlete Haile Gebreselassie and his friends as a charitable organization, is accused this week of involving in activities outside charity activities. The Charities and Civil Societies Agency has announced that it has decided to take possession of all the money and property owned by the Great Run. According to the agency, the Great Ethiopian Run was registered as a charitable organization with the Ministry of Justice. However, it failed to involve in the required activities as a charitable organization. In the last 12 years, except for some donations for two orphanage institutions, Marry joy and Abebech Gobena, the Great Run spent more time in building its own finances and image, according to the Agency. The organization gets a considerable amount of support from sponsors and ticket sales every year. In addition, the Agency accused the organization for involving in activities defined profitable by the Ethiopian law. Since the registration is a charitable organization, the Agency said that the government lost the tax it should have collected if the Great Run were registered as a profitable business organization. Haile G/Selassie told The Reporter newspaper this week that the finance of the Great Run is intended to make the annual road running event self-sustained. “We did not want to stop the annual activities if we couldn’t find sponsors. Therefore we have kept some money for securing the continuity of the Great Run,” he said. “In the first place, we tried to register as an organization other than charitable. We requested assistance from the Athletics Federation and we did not find any. It was a final option for us to register as a charitable organization,” he told the newspaper. Haile said they have now found a way to keep this year’s Great Run, and other issues are under discussion with the proper authorities. The Agency now decided to take possession of all the properties of the Great Run. According to the Agency, Great Run has ten million birr in its account and several other properties registered under its name. The Agency will possess all of this and distribute it to other charitable organizations who have been involved in the activities they have registered for from the beginning. However, considering the role of the Great Run in building the image of the country and promoting sporting activities, the Agency seems to show mercy in shutting down the organization immediately. The Great Run is given a time until the end of December 2012 to register as a business organization and continue its annual events in the country. Since it begun 12 years a go, the Ethiopian Great Run has remained as the most celebrated sporting event in the country. In addition to several regional and occasional street runs, the annual ten kilometer run in Addis Ababa, usually takes place in late November is the biggest road run in Africa. Every year, the number of participants has been growing and celebrated athletes from all over the world participate in the event. Starting with 10,000 participants in 2001, last year around 40,000 people took the road to be part of the biggest sports event of the year. This number is expected to grow considerably for the 2012 event. 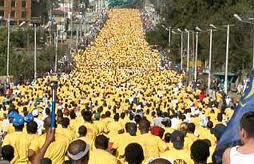 For Ethiopians the Great Run is the only public event with entertainment nature free of any religious and political cause. It has been used especially by residents of Addis Ababa as a license for demonstration to air their grievances. Political oppression, press freedom, inflation, democracy, and human rights are some of the issues the participants raised in the past. Especially for the last seven years, the Great Ethiopian Run remained the only time and place where people speak their mind on a public sphere. As a result, the trouble with the Agency might be a cause for worry for many who wait a whole year to get a chance to be part of it.